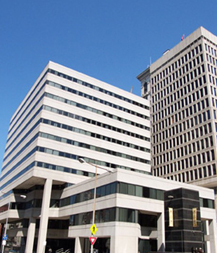 One Center Plaza is a 12 story, masonry and glass office building well located off of Center Plaza in Baltimore's central business district. The building is within walking distance of major office and governmental buildings, financial institutions and shopping and convenient to major arteries and public transportation. The building has four modern, high-speed elevators, an underground parking lot with 132 spaces, high speed Internet access and a recently upgraded lobby with marble finishes. It is heated and cooled by an efficient HVAC system with individual variable-air-volume controls and an energy management system. One Center Plaza has 24 hour, 7 day a week access with full time security service. The State of Maryland's Department of Juvenile Services is the main building tenant.